Snorkie - Is the Miniature Schnauzer Yorkie Mix Right For You? Snorkies are crossbreed dogs – they have one Miniature Schnauzer parent, and one Yorkshire Terrier parent. Ideally, the Snorkie is the perfect combination of a friendly Miniature Schnauzer and an affectionate but sassy Yorkshire Terrier. But does it always turn out that way? Is Snorkie temperament a dead cert? This article is all about what to expect from a Schnauzer Yorkie mix puppy – their appearance, personality, health, and how easy they are to train. Considering how adorable the name Snorkie is, you could almost expect it would be hard for the pup itself to measure up. However, looking at that fluffy beard and deep eyes, it’s hard to say that it doesn’t! The Snorkie is a cross between Miniature Schnauzer and a Yorkie. Since it is a crossbreed, that automatically makes it a breed for controversy. When someone takes two purebred dogs and purposely breeds them together, it’s sometimes known as a designer dog. This is where you find Pomskies, Labradoodles, and the Cockapoo as well. There are many differences between designer dogs and purebreds, which start with the differences in purebreds and mutts. Pedigree breeders can be scathing of designer dogs, because they have invested many years breeding litters of puppies which consistently and reliably have the best features of their breed. However, pedigrees aren’t always perfect in every way. Many pedigree breeding programmes contain a limited number of individual dogs. If one of those dogs has an inheritable health problem, that problem can easily spread and become fixed in a large proportion of their descendents. In fact, according to Carol Beuchat PhD at The Institute of Canine Biology, inbreeding (breeding dogs that are related) is a bigger contributor to canine health problems than cross breeding. That said, when comparing purebreds and mixed breeds, the mixed breeds are usually less predictable in every way. And that’s because there’s no way to predict what blend of qualities a mixed breed puppy will inherit from each parent. So naturally, to apply this to the Snorkie, we need to start by looking closer at both sides of their family tree. You may assume that the Yorkshire Terrier was originally created for English women of Yorkshire who wished to have a cute lapdog to show off in photos. While this may have eventually gained an element of truth, it’s not the beginning of the cute breed’s history. The Yorkie was actually created to be a hardy rat-catching dog, small enough to fit into the nooks and crannies of mills and coal mines. As for the Miniature Schnauzer, it was bred from the Standard Schnauzer as a smaller version of the German farmhand. At first Miniature Schnauzers were destined to become rat catchers too, but like the Yorkshire Terrier they quickly gained popularity as companion dogs instead. This meant breeders began to favor dogs with great pet personalities, and now the Miniature Schnauzer is known for being more obedient and less fiery than its Giant and Standard sized cousins. As for the Snorkie itself, no one really knows the exact date that a Yorkie and Schnauzer first came together to create the designer breed. But this is common with mixed breeds of all sorts! Especially those done naturally without artificial insemination. In fact, Schnauzer Yorkie cross litters probably cropped up for decades without mention before the catchy Snorkie moniker caught on. What Does a Snorkie Look Like? A Yorkshire Terrier generally weighs about 7 pounds and stands 7-8 inches tall at their shoulder blades. A Miniature Schnauzer is a bit bigger than the Yorkie with a weight range of 11-20 pounds. 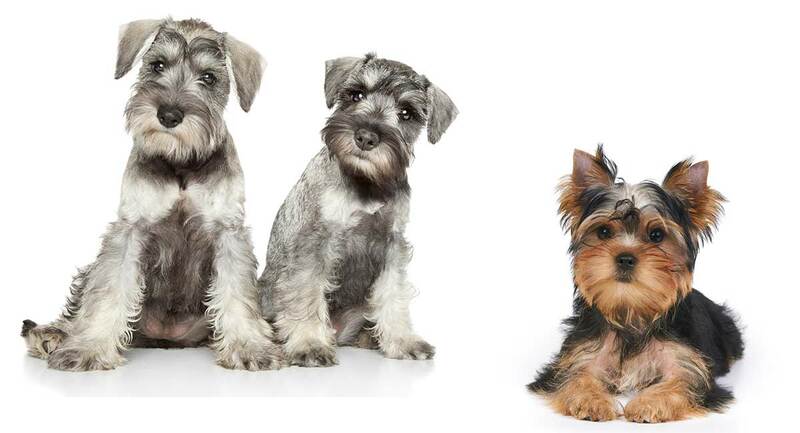 Miniature Schnauzers are a little less than twice as tall as Yorkies. With this knowledge you can safely assume that a Snorkie will be somewhere in the range of their parents. Statistically, most Snorkies will end up at a weight halfway between their parents. But some outliers could be very small like a Yorkie, or as big as a Miniature Schnauzer. There could even be a lot of variation among siblings in the same litter! But they will hardly ever reach 25lbs unless overfed. As far as appearance goes, the Yorkie is often seen as the “feminine” side of the Snorkie and the Schnauzer the “masculine” side. The biggest difference between a Yorkie and a Schnauzer’s appearance is the length of their coat. The Yorkie has a long, silky coat that is parted down the middle. Their muzzle is short and their eyes very dark. The Mini Schnauzer coat is very different as it’s rough, coarse, and much shorter than the Yorkie’s. On top of that, their muzzle is long and squarish. Their eyes also have a larger range in appearance, but can be much lighter than the Yorkie’s. As designer dogs are unpredictable in appearance, a Snorkie puppy can have with the color and texture of either parent, and even something in between. One thing Yorkshire Terrier and Miniature Schnauzer coats have in common is a high grooming requirement, and we’ll come back to that in just a bit. As small as it may be, the Yorkie makes a wonderful watchdog. They are courageous, spicy, and inherit the traits of many other terriers. They have big personalities and can come across as a bit bossy, but the right owner can use this to their strength with the right training. The Mini Schnauzer is likened to the Yorkie in that it is brave and fierce when it feels that it, or his family members, are in danger. Though both breeds are brave and fiery, neither are aggressive, so Snorkies are usually friendly dogs who get on well with others. Both of the parent breeds for the Snorkie are friendly pups, but they also both require regular exercise. Yorkies are intelligent dogs with a hearty appetite for “work”. They need physical and mental exercise everyday. Mini Schnauzers have similar energy levels as Yorkies and a strong prey drive. They do well with predatory games and love to chase their owner for fun. As far as training goes, the Snorkie can be rather unpredictable. The Mini Schnauzer is very eager to please and easy to train – they are very responsive and always paying attention. However, the Yorkie can be rather stubborn and requires greater patience. To get the best behavior from your Snorkie, you’ll need to commit to ongoing training with positive reinforcement techniques. Obedience classes and advanced classes for Snorkie adults will help you with technique, and also give your dog a place to “work”. Both the Yorkie and the Miniature Schnauzer are high maintenance dogs due to their long coats. Neither dogs’ coat sheds much, and nor will a Snorkies, but they will need brushed a few times a week to prevent matting. If you are brushing, you may still find mats in their coat. Though the breed is hardy, you must still be gentle, and work it out slowly so as not to hurt the pup. You might also find that Snorkie grooming is easier if you get a groomer to clip their hair regularly, or do it yourself. Snorkie owners tend to bathe their dog every month or two, but this depends on the dog and whether it inherits more traits from the father or mother. Yorkies may need weekly baths while the sturdy Schnauzer can go months without being affected. Yorkshire Terriers and Miniature Schnauzers are both pedigree dogs, which inevitably means that they are more than averagely predisposed to some inheritable illnesses. Some of these illnesses can also be passed on to Snorkie puppies. One of the biggest major health concerns for the Snorkie (inherited from the Schnauzer) are pancreas-related diseases. These include diabetes and pancreatitis. It’s important to keep your dog healthy, exercised, and well-fed throughout its life to lessen the risks of diabetes. Watch for symptoms including changes in appetite, increased urination, vomiting, cataracts and skin infections, and take your dog to the vet regularly. Diabetes takes time, attention, and care, but it is manageable. It can happen to any dog, but if your Snorkie has a history of diabetes in their family tree, it is more likely to be something you will have to face. Miniature Schnauzers are also particularly vulnerable to heart problems, some of which could potentially be inherited by Snorkie puppies. All Mini Schnauzers should have a full cardiac exam before they are used for breeding – your breeder will have the results of this and should be happy to discuss them with you. Miniature Schnauzers are also prone to eye problems, skin disorders, epilepsy, and renal failure. You can read more about all of these conditions in our complete Miniature Schnauzer breed review. We don’t fully understand the inheritance of these illnesses, and how much (if any) protection being a Schnauzer Yorkie mix offers against them. Keep in mind that with designer breeds, health concerns can often be unpredictable just as any other traits they may inherit. A good breeder will know the medical history of their puppies’ parents and grandparents, so that you at least have an idea of which conditions could be passed on. Now let’s turn to Yorkshire Terrier health, and what conditions a Yorkie might pass down to a Snorkie. and hypoglycaemia (low blood sugar). Some of these – such as luxating patellas – can be screened for before a Yorkshire Terrier is used to breed from. The good news is, because the most common health problems of Schnauzers and Yorkies don’t overlap, they are are more likely to be mitigated than exacerbated in the Yorkshire Terrier Schnauzer mix. Many genetic illnesses depend on inheriting the faulty genes that cause them from both parents. A Yorkshire Terrier and Miniature Schnauzer are unlikely to have the same genetic weaknesses, so their puppies might be protected against some of the conditions we’ve listed (unfortunately it will take a lot more scientific research before we can predict exactly which though). Good breeders make sure both parents have a complete veterinary check up before they mate, and will share all the result of that with you. So the best way to find a healthy Snorkie puppy, is to find a reputable breeder. Since designer breeds aren’t recognized by the AKC, getting a Snorkie can be tricky. However, there are many kennels and breeders out there who want to find perfect homes for their pups! Though appearance is something to consider when finding “your” Snorkie, remember to ask the breeder about any health conditions that the parents have had. This can tell you a lot about the health of their puppies. It might not drive you away, but if you don’t have the time or money to care for a dog who may have hereditary problems, that’s understandable. Dogs are meant to bring us joy, but it’s our responsibility as owners to make sure they receive the care that they need! Finally, bear in mind that sadly the trendy “Snorkie” label means that many puppy farms are currently willing to breed these little dogs in poor conditions to make a quick buck. Use our guide to finding a breeder to make sure you don’t accidentally support this cruel industry. Is a Snorkie Right for You? How can you tell if a Snorkie dog is the right fit for you? Both of the parent breeds of the Snorkie have lively minds and lots of energy. If you don’t have the time or resources at the moment for lots of exercise and training, a Snorkie might not be the right dog for you. It’s important to groom Snorkies regularly as they are high-maintenance. If this sounds like a chore rather than a pleasure, you might not enjoy owning a Snorkie at this time. Will your Snorkie need to get along with children? Miniature Schnauzers have great reputations as family dogs, whereas a Yorkies are more likely to lose patience and snap at clumsy or over-persistent children. And remember, designer breeds are like boxes of chocolates! You never know what you might get! Do You Own A Snorkie? Why did you choose a Schnauzer Yorkie puppy, and what has your experience been? Share your experience with other prospective Snorkie parents in the comments box below! Looking for a snorkie puppy. Any suggestions would be appreciated! We have had our Snorkie for 4 weeks. He’s 3 months old. He’s so sweet and smart. He has no idea he only weighs 7 pounds and plays with our 120 pound Rottweiler non-stop. He’s so funny and has so much personality. Max talks to me all of the time and we are working on potty training. Love our Max. We got a female Snorkie (who we named Sukki) when she was 3 months old and weighed 3 pounds. She is now 7 years and 7 months old and weighs 10 pounds. She is by far the best, most fun little dog we’ve ever had. She is very energetic and loves running around outside. She trained very easily and never goes near the road. She loves to chase squirrels, rabbits, moose, chickens or anything else that comes into the yard. She will quickly kill any mice, moles, snakes or frogs that she finds on the property. Thankfully, we don’t have poisonous snakes in Central Maine! She’s very playful and loves everyone. Loves to ride in the car or go kayaking on ponds and calm rivers with me. She goes hiking with me and has climbed several mountains with me! Very loving, cuddly, loyal companion and watchdog. And, YES, she is bossy!! She lets us know what she wants and when she wants something, she wants it NOW! She won’t let up until we wait on her…hahaha! Ok I have owned a snorkel named Maddie for almost a year and I can tell you she took after the Yorkie with the training part. I just got my Snorkie about 3 weeks ago and I have fallen in love with her! Her name is Pepper and she just past 12 weeks old. Right now she only weighs 5.8 lbs, so I think she’s going to be a little gal. She’s biting a lot in either play or protection (doesn’t like to cuddle), so I need to get her to puppy training. We are working on the potty training and have made some progress. I’m looking forward to years with Pepper! Where did you get your snorkie? There doesn’t seem to be many breeders around. I’m in Southern CA. We rescued ours this week he is 3 YRS OLD chipped and trained. The rescue said he came from Pa.
We have a snorkie named Mac and he is 5 yrs old. We got him from my cousin who has his mother and father and grandmother! And now his sister from the same liter. Mac is the best dog! He is so good with kids. A little agressive with other dogs at first but just to establish who is boss. Which is him! He is very loyal and loving but also playful and fun. He was quick to train and never goes poty in the house. He’s a great and extremely important member of our family! We are so lucky to have him! He’s a good boy and does his job of loving his family well. Even our newly added Lab- Catahoula mix. He had accepted her but I do think he prefers being the Top Dog! Does anyone know a reputable breeder or rescue group in California where I could find a Snorkie? We lost ours at 10, recently to a sudden acute pancreatitis event. I have fallen in love with the breed! We recently rescued a Snorkie that just turned 6. You would think he was a puppy. He is so energetic and playful, I’m can’t believe he hasn’t slowed down. He loves to play and chase lizards. He is a true lap dog and loved to be loved. When we got him a month ago and he weighed 11.6 lbs and now is 12.9lbs. The Vet says not to let him weigh. What do Snorkies usually weigh? Our Yorkie that passed in Nov, weighed 5 lbs! Aubrey actually rescued us! He is so funny to watch. We are a very lucky family to be owned by a Snorkie! Our girl was rescued from Craigslist “free to a good home”. We couldn’t resist helping to save her, she is adorable! We are all in love with this sweet, gentle, funny, and very intelligent little character. She is very loving and protective, a bit bossy at times, but so good natured-her little tail never stops wagging. I highly recommend the Snorkie. Ours has made our family complete.